Modern synthetic gemstone is the point where the Crytur’s high-tech business meets with the long tradition of jewellery and gem mining, crafts that have been present in Turnov and surrounding country for centuries. 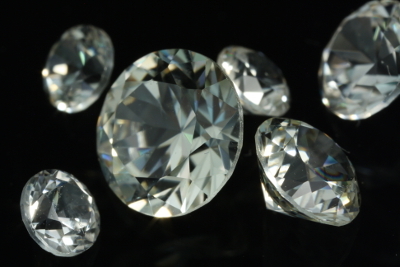 Beside the traditional ability of fine gems to reflect or disperse light (BRILLIANCE, LUSTER, FIRE) Crytur’s gems have another ability LUMINESCENCE. It gives to gems ability to actively shine when it is irradiated by light of short wavelength (e.g. blue, ultraviolet). We have control over this effect, mainly by doping chemical elements from the group of rare earths or by post-treatment of grown crystals. Luminescence becomes mostly apparent in the crystals combined with additional light source, e.g. LED diode. It opens the doors to the modern design. Undoped YAG enriched by color centers looks like transparent and colorless gem under white light but it shines in blue-violet when irradiated by light of ultraviolet lamp. Cerium-doped YAG gem has inherent deep yellow color under white light but it shines by intense yellow-green color whenever the crystal is exposed to blue or ultraviolet light. Crytur can supply you either uncut raw material or cut jewel stones or even jewels in collaboration with local jewellers.